A multi-media percussion solo inspired by Shakespeare's The Tempest. Created by Peter Swendsen and myself in collaboration with Amy Miller, Asha Tamirisa, Vera Rudi, Christiana Rose, Gunhild Mathea Olaussen. Funded by Arts Council Norway and Norwegian Artistic Research Programme. World Premeire September 2016. More info HERE. A show by Francois Sarhan. A fascinating lecture on the history, mystery, beauty, truth, and transcendence of the iconic percussion instrument, the triangle (△). Funded by Arts Council Norway and Norwegian Artistic Research Programme. 2015-2016 performances in Sweden, Latvia, Norway, Iceland, Ireland. and Greece. An installation-performance by Trond Reinholdtsen and myself. Funded by the Norwegian Artistic Research Programme and the Arts Council Norway. World premiere at Dark Music Day 2018, Reykjavik, Iceland. An installation-performance for four blind-folded audience participants and one solo percussionist. By Wojtek Blecharz in collaboration with Jennifer Torrence. A work for 9 bells and athletic percussionist by Tom Johnson. Performance in Warsaw, Poland 2017, Oslo, Norway 2018, Reykjavik, Iceland 2019. 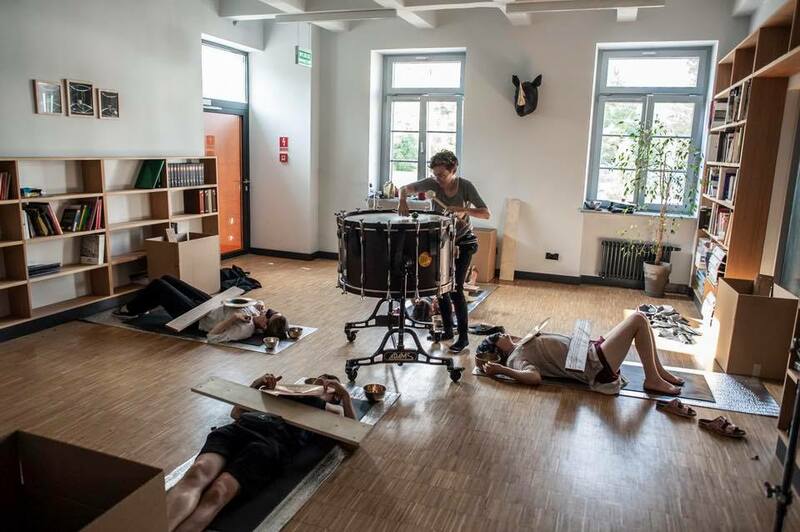 A site-specific work for solo percussionist by Johan Jutterström. Upcoming premiere and performances in several cities in Sweden, Norway and Berlin 2016 - 2017. A program about losing the voice due to oppression, disease, and secrecy. Works by Mark Applebaum, Francois Sarhan, Morton Feldman, and Lewis Nielson. Recent performances include, Av Garde, Bergen 2013, Emergency Exit Festival, Bodø 2012, Speak Percussion Studio, Melbourne 2013, and University of Canterbury, Christchurch New Zealand 2015. A program of works about love, both requited and unrequited, secret and proclaimed. Works by Liza Lim/Torrence, Wojtek Blecharz, Jeff Trevino, and Xenakis. A one-hour work for percussion soloist by Matt Sargent. Recent performances include at The Wulf, Los Angeles, 2011. PLATEAUX, by Lars Skoglund, for percussionist and ensemble. Premiered in 2017 with Ensemble neoN, Norway. EX, by John Persen, for marimba and ensemble. Recent peroformances: Ilios Festival 2017, NOSO Sinfonietta, under Tim Weiss. DOUBLE CONCERTO, by Unsuk Chin, for piano and percussion and ensemble. - Recent performances: Bodø Sinfonietta; Ellen Ugelvik, piano; Magnus Loddgard, direction; March 2013; and Oberlin Contemporary Music Ensemble; Ran Duan, piano; Tim Weiss, direction; March 2008. MA'MOUNIA, by Heinz Holliger, for percussionist and small ensemble. - Recent performances: UCSD and CalArts, California; Nicholas DeMaison, direction, January 2011; International Ensemble Modern Academy; Frank Oulu, direction; Schwaz, Austria 2010. REPONS, by Pierre Boulez, for six soloists, large orchestra, and live electronics. (solo xylophone/glockenspiel) - Recent performances: Lucerne Festival 2009, Lucerne Switzerland; Lucerne Festival Academy; Pierre Boulez, Direction; IRCAM, live electronics.